My husband sent me this email while I was at Christmas Eve Mass, along with this picture of our visitor under the tree. You may remember that last year he wrapped my presents as R2-D2. 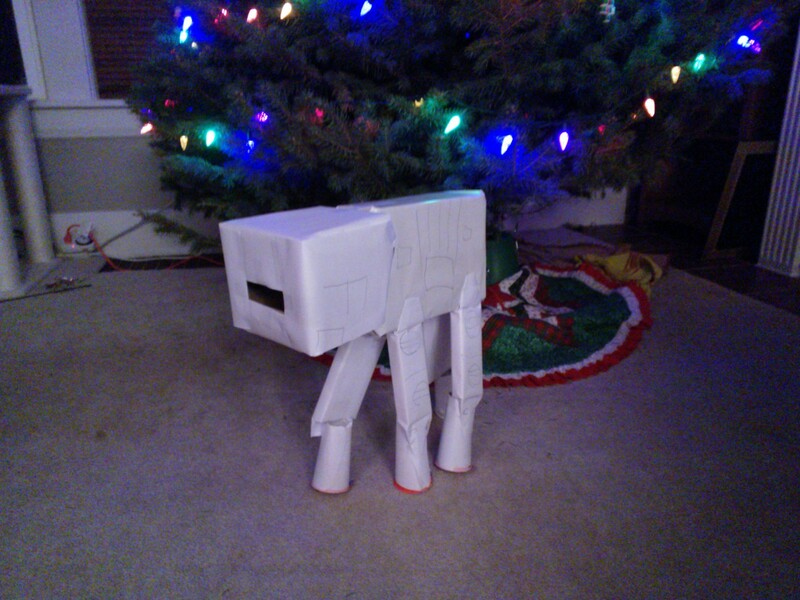 This year he chose to make an AT-AT walker, as featured in The Empire Strikes Back during the attack on the Rebels’ Hoth base. The legs are made from pocky and other candies, the body had other presents in a box (including a beautiful Molskine notebook…must do more writing this year), and the head is just empty cardboard. He didn’t want to put anything in the head, since he left a hole for the “cockpit” viewscreen that would allow me to peek inside, and that’s CHEATING. Here’s the destruction of the AT-AT walker (aka unwrapping it). I was always really, really horrible at this level in the N64 Rogue Squadron and Shadows of the Empire games. The tow cable thing is hard, man. Major props to Wedge and Janson. The finished product, with details drawn on. It even stands up on its own! Nice work hubby! My husband definitely didn’t do anything like this. But I did get one of those Jedi bathrobes from him for Christmas 🙂 I also failed dismally at that level in the gamecube x-wing game and gave up. Never got past it. Like you, I couldn’t get the tow cable to detach at precisely the right place/time.